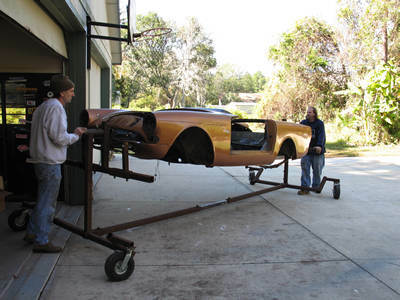 The Tiger was stripped to its bare shell and mounted on this rotisserie. We’ve stripped our Sunbeam Tiger down to it’s bare unibody shell. It was then mounted to a rotisserie that will allow us to restore the undercarriage without trouble. It’s much easier to clean a car, fix damage and repaint the underside when it’s mounted on a rotisserie. Our first step is to degrease the gook and grime off the chassis.